Join us to celebrate the American Bison Society 110th anniversary! The 2016 American Bison Society Meeting and Workshops theme will be “The Social and Cultural Dimensions of Bison Ecological Restoration”. The American Bison Society (ABS) established by the Director of the New York Zoological Society, William Hornaday with the support of U.S. President Theodore Roosevelt, Canadian Governor Earl Grey and many other notable characters had for the mission “preservation and increase of the American Bison”. In 2006, the Society was re-established by the Wildlife Conservation Society (WCS) and met again to continue the passion of these pioneers to save the wild bison from extinction. 110 years since ABS was established important progress has been made to restore wild bison to large landscape in Canada and USA using a variety of strategies and approaches. 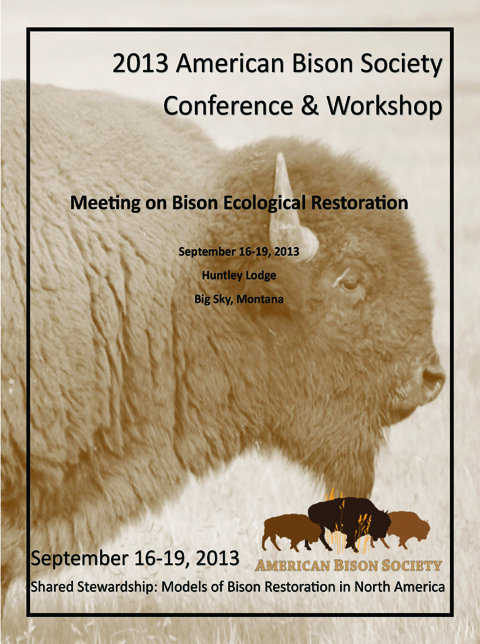 It is now time to reconvene and explore the successes and challenges for bison ecological restoration across North America. For the first time in its history the ABS will meet in Canada, at The Banff Centre in Banff National Park. Bison enthusiasts, managers, producers, advocates, philanthropists, and artists are invited to share experiences and strategies to guide future progress toward the ecological restoration of wood and plains bison. 26th September, 2016 - IUCN Bison Specialist group will meet on Sept. 26, 2016 - on invitation only. The American Bison Society and the Wildlife Conservation Society, in collaboration with a coalition of supporters, are proud to support the proposed bill to enact bison as our national mammal (H.R. 3400, the National Bison Legacy Act.) The iconic bison has cultural, economical and ecological significance across the American landscape and is impeccably qualified to join the bald eagle as a symbol of the United States. It's an animal we can stand behind as national mammal—but we need your support to make it happen. Please join this historic grassroots campaign: Ask your Representatives in the U.S. House to cosponsor the National Bison Legacy Act. The largest land mammal in the country, our nominee helped shape the Great Plains and the lifestyle of the Native Americans who lived there. Bison have been important for centuries to our history and culture, and today, they live in all 50 states. Bison are an American icon. Bison are profiled on coins, depicted on the Department of the Interior's seal, and featured on logos of sports teams, businesses, and academic institutions. Three states have designated bison as their official state mammal or animal. Adoption as the National Mammal would celebrate bison's special place in our national heritage, as well as the contributions bison make to American life now and will for centuries to come. On October 30, 2013, Representatives Wm. Lacy Clay (MO-1), Fortenberry (NE-1), Noem (SD-At Large), and Serrano (NY-15) introduced H.R. 3400, the National Bison Legacy Act, to adopt the American bison as the National Mammal of the U.S. Similar legislation was introduced in the 112th Congress, earning the support of 31 Senators and Representatives. The sun spills into the Lamar Valley in Yellowstone National Park on a late-summer morning, revealing hundreds of grazing bison framed by the Absaroka Mountains. Bulls have joined groups of cows with now-grown calves in anticipation of the rut, leaving a stark impression that this iconic animal is thriving. As impressive as this sight is, it only hints at what was. Today, bison conservation and management is rife with complex issues that dampen efforts to establish wide-ranging bison herds able to fulfill their keystone role on prairie grasslands. In order to not only continue reintroduction, but to do so in a way that ultimately benefits the landscape, the species and the people who live with and around bison, the ABS gathered in 2013 to host its 4th Biennial Conference to explore an important theme: “Shared stewardship.” Over three days, nearly 150 scientists, managers,tribes and citizens working on bison-related projects from Alaska to Mexico gathered in Big Sky, Montana to listen and learn about bison conservation challenges, successes, and lessons learned. Given his extensive career steeped in these issues, Aune recognizes that: “We’ve developed the science to support bison restoration, now we need to focus on the ‘how’—how do we do this work across multiple jurisdictions.” The current work of the ABS is applying these integrated social, political and public engagement pieces that are each necessary to take the next steps in bison restoration. Click here to read more about this ABS conference. The IUCN helps the world find pragmatic solutions to our most pressing environment and development challenges. 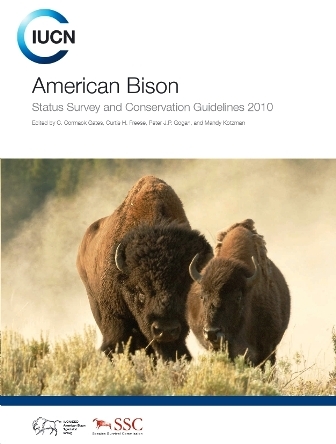 The IUCN bison report was developed by a cooperative effort of expert contributors over a three year collaboration that was made possible with funding from several non-governmental organizations and government agencies including the World Wildlife Fund, the Wildlife Conservation Society, the University of Calgary Faculty of Environmental Design, the American Bison Society, the US Geological Survey and the US National Parks Service. Read the full IUCN American Bison Report.